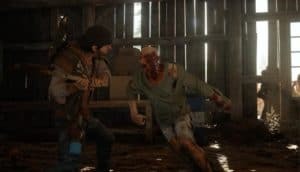 Days Gone Delayed Until 2019 | Nerd Much? Keen eyes have noticed that the date on Days Gone official page has changed from 2018 to 2019. According to US Gamer, who reached out to Sony for clarification, the change was deliberate. However, Sony offered no details on what caused the delay or what the status of the game is. If you are a fan of Days Gone and worried about the game, be assured that this game is a PS4 exclusive and Sony is always very dedicated to such titles. Furthermore, we want to see the best Days Gone has to offer. Judging by the trailers thus far, the game looks like it is going to be as heavily story-based as The Last of Us and offers a real sense of danger with the rather insane swarms of zombies players will have to deal with. As for gameplay, Days Gone will have an entirely open-world experience. Players will be roaming the vast Pacific Northwest with Deacon’s Drifter bike, ideal for a fast getaway and shooting from the hip. Players can find resources just about everywhere, from abandoned vehicles to towns and buildings. Though players will have to be careful with the latter, as such areas are usually highly populated with zombies. However, each challenge within the game “can be approached and completed in an almost infinite number of ways.” It is up to the players what items, weapons, and terrain to use to their advantage. It will interesting to see how such statements work out in the end, as the same can be said for Far Cry games. Are you looking forward to Days Gone? Are you glad for the delay so they can really polish the game? Does the world really need another zombie game? Let us know your thoughts in the comments below. You can pre-order Days Gone on Amazon or at Gamestop.